Say hello to decadent dark chocolate, gooey marshmallow goodness, and some extremely satisfied taste buds. Dark chocolate Mallo Cups have everything you love about our classic milk chocolate Mallo Cups, but with the deliciously bitter-sweet flavor of decadent dark chocolate. Dark chocolate candy is perfect for those who want a more pronounced chocolate taste. If you’re a self-proclaimed chocoholic, Dark Chocolate Mallo Cups are sure to satisfy. This delicious chocolate marshmallow candy is a hands-down favorite, and proudly made in the USA. We take pride in carrying on the Boyer family tradition, and take confidence in satisfying any candy lover or sweet tooth’s craving for the very best candy. From Mallo Cups to chocolate covered pretzels, candy isn’t the same if it doesn’t have Boyer in the name. Whether stocking up on Easter candy, Halloween candy, or satisfying your everyday cravings, choose BoyerCandies.com. 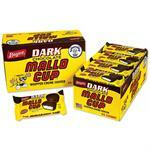 Sink your teeth into a dark chocolate Mallo Cup today!